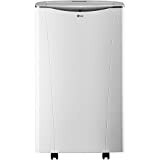 LG Electronics - LP1415WXRSM : Portable Air Conditioner Review • The Air Geeks, reviews of air conditioners, dehumidifiers and air purifiers. The LP1415WXRSM is a large and heavy portable air conditioner that offers advanced controls. This air cooling system delivers an impressive capacity of 14,000 BTU. Its high capacity makes it a suitable solution for medium and relatively large rooms. Are you looking for a suitable cooling system for your office, bedroom, or living room? If your answer is yes, then you need to consider the LP1415WXRSM. If you are already considering this unit and you are looking for reliable information about its features and performance, then you are in the right place. We have thoroughly researched to provide you with unbiased information about this air cooling system. Whether you want to know about its features, strengths, or weaknesses, we have gathered all that for you at the Air Geeks. Without wasting time, we will start with its description. 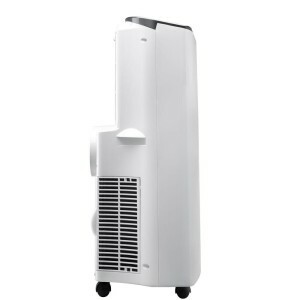 If you are looking for an air conditioner for a medium or large room, then you need a high capacity unit. The LP1415WXRSM is a strong cooling system that offers a high capacity of 14,000 BTU. According to the manufacturer, this portable system is suitable for spaces that are as large as 500 square feet. Nevertheless, our research revealed that this unit offers best performance in smaller spaces. Apart from cooling your room, this air conditioner features a built-in dehumidifier that ensures that the air in your room is cool and free from excess moisture. Its dehumidification function offers a capacity of up to 3.4 pints per hour. This combination of cooling and dehumidification functions transforms your room to ensure that it has a comfortable environment. The LP1415WXRSM offers advanced control features to allow you to control the environment of your house or office with ease. To start with, this cooling system allows users to control it through Wi-Fi technology. You can therefore adjust the conditions of your room from anywhere. In addition, this air conditioner features an LCD remote control and an LED display panel. In case you are looking for a system that allows easy and convenient control, then the LP1415WXRSM is a suitable option. Furthermore, this unit offers multiple speeds, energy saver mode, and a 24-hour on/off timer. Like most home appliances that have a fan and a compressor, this air conditioner produces sound. From our research, we have observed that this unit is louder than most units of same capacity. Do you intend to use it in a quiet place? Considering its noise level, the LP1415WXRSM may not be a suitable unit for your bedroom or any other quiet place. It is easy unpack and install the LP1415WXRSM. However, we noted that it may be difficult for some people to set the system so that they can control it through Wi-Fi. Most users have complained that they had problems when setting up the system to use Wi-Fi. Wi-Fi technology allows easy control of the AC. Users can easily control and monitor the environment of their rooms from anywhere as long as they are connected to the internet. Effective cooling and moisture control. This air conditioner cools the house effectively and within a short time. Its built-in dehumidifier ensures that the air in your house is cool and dry. Large and heavy. The LP1415WXRSM is a bulky unit and lifting it can be a problem. However, this unit has caster wheels that make it easy to move it from one position to another. Relatively loud. We have observed that this unit is noisier than most units of same capacity. It can cause disturbances if it is placed in a quiet place. NOW THIS IS AN A/C UNIT! 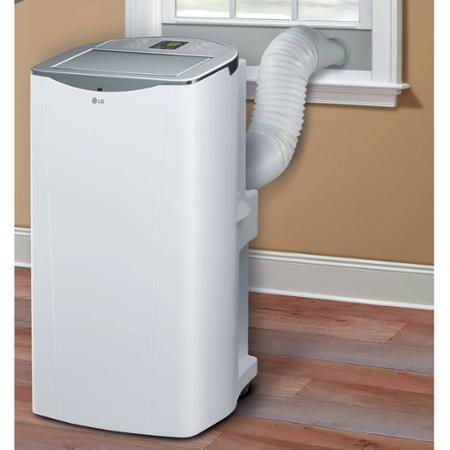 The LG is amazing, it cools down a room in under 2 mins, using them in all my bedrooms which are about 400 sq ft, one in my living room which is 650 sq feet . Easy to install and use. Love the fact it connects to wifi, I can cool down the different rooms before I am even home via my iPhone. Lovely design and they are not too loud. Highly recommend." I like being able to control the unit from any place using my smart phone. you have to DL the app to your phone to use the advanced controls of this unit and to add it to your wireless router ie sign up configure wireless security. I connected the exhaust hose to my window and sealed it shut using thermal reflective foam that I got at home depot. my bed room is more then 500 SQ on a 104F day outside I was able to keep the bedroom at a cool 65F and maintain it. my room was 94F before I switched the AC on and it not only dropped the temperature way down it only taken 1hr to drop the temperature by this much if your room only has a 15 amp breaker like my rental condo you will not be able to run this and a AMD crossfire pc is my only issue as it does use power its 14,000 BTU portable unit though it doesn't raise the power bill that much and I do use it 6hours a night for when I sleep." In case you are looking for an air conditioner that will allow you to adjust the environment of your room from virtually anywhere, then you should consider this air conditioner. This unit offers a high capacity and it is suitable for medium and relatively large rooms. If you want to transform the environment of your room, then the LP1415WXRSM will help you to achieve that. This air conditioner costs $600. Although this unit is strongly built and offers unique features, we have noted that it produces a loud sound. This characteristic makes it an unsuitable AC for use in quiet places such as offices and bedrooms. Moreover, this unit is bulky and lifting it can be a problem! Only a good choice for technophiles – for Air Geeks like us, wi-fi enabled commands remains an anecdotical gadget at this point.